1.3) The seller is the official Mediator of the Insurance Company "Europa". The insurance company "Europa" grants the Seller the right to sell its insurance in the Elitar Partner Białorus variant. 1.4) The insurance contract is concluded between the Buyer and the Insurance Company "Europa" via the Internet with the use of this Service. 1.5) The insurance meets the requirements of the Decree of the President of the Republic of Belarus "On compulsory medical insurance for foreign citizens and stateless persons temporarily staying in the Republic of Belarus" and the agreement between the Belarusian Republican Unitary Insurance Enterprise BELGOSSTRAKH and TU Europa S.A.
2.1) In order to conclude an insurance contract, the Buyer must provide its data via the form on the Service page. The insurance period during which it will be valid in Belarus - a maximum of 365 days. E-mail - where the insurance policy will be sent. 2.2) The service will not be executed if not all of the data listed in 2.1 is specified by the Buyer. 2.3) Insurance policy is issued by the Insurance Company "Europe" with the consent of Belgosstrakh. 2.4) At the moment when the buyer pays for the order, automatically it means his agreement to these Terms of Service. 2.5) The seller accepts payment online by credit or debit cards, and Paypal if the payment is more than 20 PLN. 3.3) Order paid online using Ecard or PayPal systems is implemented instantly. Insurance policy will be delivered to the Buyer's e-mail within 1-5 minutes, and also provided for downloading on the Service page. Section 4. Changing client data. 4.1) To change the data in the insurance contract, the Buyer should send to Seller via the contact form on the main page the information for the changing. 4.2) Changes are made on work days from 10 to 16 hours on CET. 4.3) The changed insurance policy is sent to the same email of the Buyer that was specified when making a payment in the Service. 5.1) The seller is obliged to transfer information about the Buyer to the Insurance Company "Europa" for the purpose of issuing an insurance contract valid on the territory of Belarus..
5.2) The seller must send a confirmation of the concluded contract in the form of an insurance policy to the Buyer's email address. 6.1) Before the Order, the Buyer must ensure that his passport is suitable for travel abroad. 6.2) The buyer must provide the correct data from his passport and contact details in the Service. 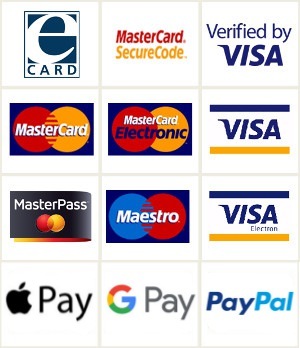 7.1) Payment for a Pass can be made using online bank card payment or Paypal system. 7.3) Bank card payment served by eCard S.A.
8.2) Complaints about the services must be provided to the carrier in any time. Section 9. The refusal of the Service. 9.1) The cancellation of the insurance contract is possible only until the day preceding the start of the insurance policy validity in Belarus. 9.2) In case of cancellation of the insurance contract, the Buyer must write to the Seller's address through the contact form on the main page of the Service, providing the persons' data or the policy number for the refusal. 9.4) The return of money will come to the account of the payment card with which the Order was paid. 9.5) Refund for order paid by Paypal will be made to the paypal account of the Buyer. 9.6) Refuse from the Service in any other case except 9.1 is not give the right to a refund. Section 10. Personal Data Security Policy. 10.1) Pursuant to Regulation 2016/679 of the European Parliament and the Council of 27 April 2016 on the protection of personal data (hereinafter: GDPR), we provide protection of all personal data that have been obtained as a result of conducting business and the execution of your orders on our website. 10.2) The Seller guarantees that the personal data of the Buyer will be processed exclusively for the purposes of the order. 10.4) The customer has the right to limit the processing of his data or object to the processing of data, or to limit their processing, but in such cases the contract with the customer can not be concluded. After conclusion the Agreement, the Customer has the right to be forgotten, i.e. requests from Raman Bantser WEB to delete personal data in accordance with the law. 10.5) The Seller will not provide customer information to third parties except listed in 10.3 cases.